Here is the next sheet from WolfPack Decals and again, they have chosen a very nice potpourri subjects. A bit of something for everyone. This is one of the reasons I really like Wolfpack decals. Most other decal makers tend to do the same subject on each sheet, but this way, we get a variety of interesting aircraft. Now some of these schemes will require the use of some kit markings to supplement what WolfPack Decals provides, but that should not be a problem. Some of these options may also require a bit of modification by the modeler but nothing too involved. The Instructions provided are among the best in the industry with a long historical background of each of the subjects in question. There is also a list of kits and while in some cases, not all of the ones available are there, the best ones are. The decals themselves are superbly printed by Fantasy Printshop and without any registration problems. I did notice that some of the yellow lettering on white backgrounds is rather indistinct, but that is a pretty common problem. You will also find that the carrier film is a bit more than you may be used to, but it is easily trimmed back before use. OK, preliminaries out of the way, so let us see what is on this one. First are two P-3 Orions from the now extinct VP-66 that was at NAS Willow Grove, PA. Two tactical paint scheme planes. One a standard P-3C and the other an EP-3J that was used for aggressor training against ships. This one has an additional antenna or two and the MAD boom removed as it wasn't needed. This aircraft was based on a P-3A airframe. Next a nice Virginia ANG F-47D in unpainted metal with yellow trim. I'm not sure if any of the extant kits have the larger fin fillet or not so you may have to produce that from plastic card. An F-15C from the 94th FS/1st FW is next. This unit has since transitioned to the F-22A. There are a few mods that will need to be made to extant kits and all that information is provided in the instructions. From the 334 FS/4 FW is this Euro 1 painted F-4E Phantom II. Undoubtedly the worst paint scheme for photographers (aside from the 'shamu' scheme), we were all quite pleased when things moved to the lighter Hill Grey II scheme in 1989. The modeler will need to add the ARN-101 fairing on the upper fuselage if not provided in the kit. It also has the extended slats and TIESO on the wing leading edge. Though not shown in the drawing, it probably also had the reinforced stabilator. A nice TPS painted OV-10D is next. 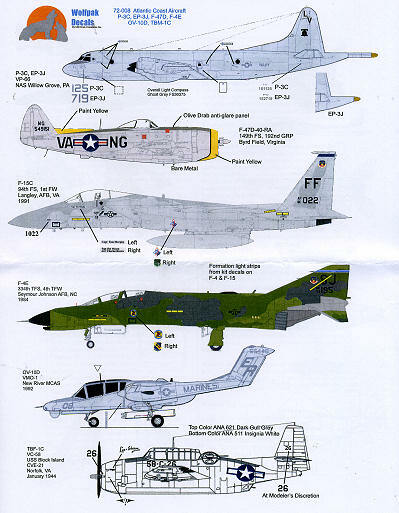 This is the final scheme carried by these planes before all the OV-10 units went away in the mid 1990s. This particular aircraft is from VMO-1. The final option is a TBF-1C from VC-58 aboard USS Block Island in 1944. These planes were painted in the 'Atlantic' scheme of dark gull grey uppers with the rest in white. A nice change from the usual blues schemes carried by these planes. 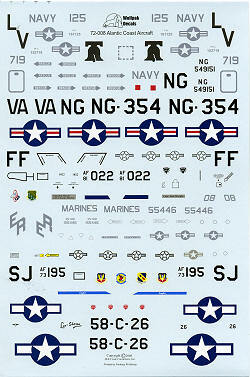 As an addendum, Wolf Pack Decals has printed a correction sheet (US insignia) for set 72006. Contact them if you need one.